I Love You More Than Carrots: The Middle Place. Shameless Book Plug. Yesterday, while sitting in the Mazda dealership waiting for a new tire, I downloaded Kelly Corrigan's "The Middle Place" on my Kindle. First, you need to understand that I typically choose books based on the proverbial back-cover "blurb" and therefore, I scooped up this gem-of-a-memoir as soon as I read that it's about the relationship between a daughter and her father. Sometimes this haphazard way of choosing books is an absolute bust, but more times than not, it is a huge success. I couldn't even get through the prologue without welling up. Please pick it up. It's worth the out-loud laughter as well as the tears. Never before have I become so immediately absorbed in a story- so compelled to stay up just a minute longer to read the next page. 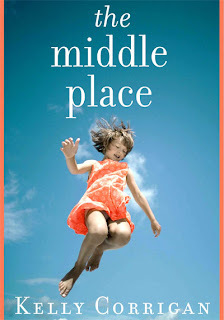 Kelly Corrigan writes about that "middle place" between childhood and parenthood. When you've grown up, become a wife, a mother and yet, still, you are someone's daughter. "...And that's what this whole thing is about. Calling home. Instinctively. Even when all the paperwork- a marriage license, a notarized deed, two birth certificates, and seven years of tax returns- clearly indicates you're an adult, but all the same, there you are, clutching the phone and thanking God that you're still somebody's daughter." Wow. I might just have to get this. Sounds like something I wouldn't put down! Thanks for sharing! As uncomfortable and angsty as they might be, the middle place years are your true salad days. "salad days, / When I was green in judgment, cold in blood." Most often "salad days" refers to the time of youth after high school or college before you marry. But for those of us who have met our lifemates, the days before children are true salad days. With more money and time at your disposal, vacations and lazy days at home, long nights together with no fear of interruption are the days you will look back on in the future. They will sustain you through life's challenges and help renew your love when you think all is lost. I am adding this to my must read list. It sounds wonderful! I can't wait to pick this one up! It looks fabulous! I could always use a good cry. . .and laugh of course.